Not long ago Philips presented the 530 model, and now we are already reviewing the middle-segment phone – the Philips 350. Most of our readers probably think of the Motorola C350 when reading the model's title, and that's not just an innocent coincidence. Philips presents a new model in the same segment where Motorola was presenting its C350 earlier on. This means that the new model is targeted for middle-class phones with very big emphasis on teenagers. 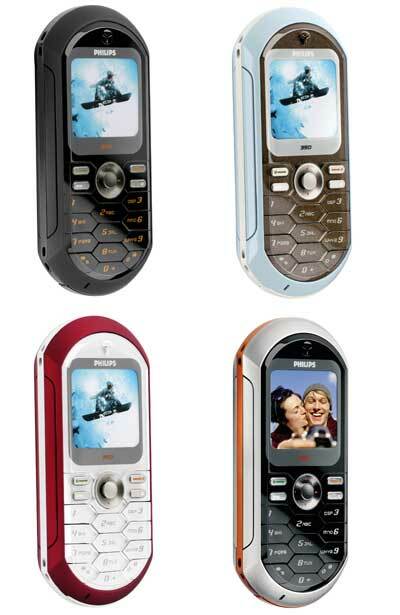 This model is based on the Philips 530 and is almost the same phone with FM-radio and some additional features removed. Once again Philips decided to show us their views on modern design - the 350 looks rather unusual and stands out from other phones extremely well. First thing you'd probably notice is the keyboard. The keys are borderline cell-shaped, which is a very original decision. Well hey, after all it's a CELL phone. The keys are big enough, so it's rather hard to mistype. Before a commercial version of the phone will be released Philips promised to improve the keyboard by increasing key-travel length, which will in turn result in improved comfort while using the phone. In my opinion, the way the designers work right now is absolutely correct, I only wish they’ll manage to fulfill their plans. The numbers on the keys are written in an elegant font. When the phone faces direct sunlight it's impossible to see the backlight, but the numbers on the keyboard are clearly seen. In the dark, the backlight becomes very nicely visible in orange. A five-directional joystick is used for navigating the menu. 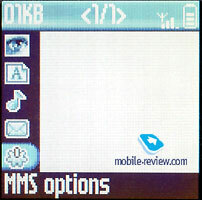 The soft-keys are rather small, there is a special button for MMS-messages access or the camera (which is not shipped with the phone). This model will be shipping in various colours (Red, Silver, Black and Blue), but the phone's both sides will remain unchanged in silver with the addition of some color; the phone which we had featured orange. The front of the phone is glossy, which makes it look like jewelry. When in stand-by mode the screen easily blurs with the case and it's hard to see a picture at all, which all changes when you get the backlight (and with that the clarity) back on. 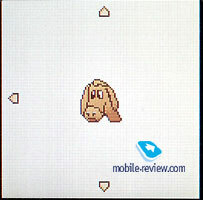 This problem is typical for the type of the screen used. 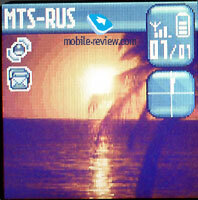 The owner can modify the contrast level, and with maximum contrast the screen will be the brightest. 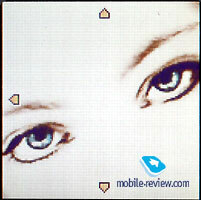 The screen resolution is 112x112 pixels (28x28mm) STN-type, and the screen looks pale in broad daylight, but it's still readable, which is a parameter of the phone that is a lot weaker than that of Samsung's phones. 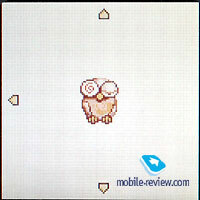 Up to 4096 colors can be shown at once, but with a not very saturated picture. 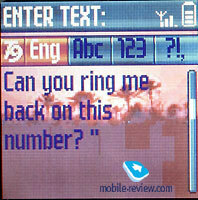 Five text lines can be shown, plus two for service needs. No soft buttons are located on the phone's sides. Locations for phone-strap are located on both sides of the phone, which means that it will cover the whole phone, not just one side of it. You can connect a handsfree device to the bottom of handset, where a special port is located together with the charger port. This group of ports is covered by a rubber cap, which is connected to the handset's casing to prevent you from accidently losing it. The back panel of the phone is of the same colour as the front. 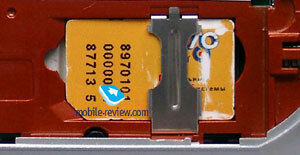 The plastic gives a velvet-like sensation (similar to that of the Motorola V300 and the Sony Ericsson Z200). The back panel leaves a good tactual feeling. The back cover is held by only one fixator, which is why you can feel some “backlash”. If you grab the phone really hard you will hear it squeak. Let me remind you that we are reviewing a prototype, and most likely this event will be taken into consideration before the commercial release. You can remove the cover easily by pulling the fixator towards yourself. Inside you will see a Li-Ion battery at 720 mAh. Philips claims that the phone will work 200 hours in stand-by mode and up to 3.5 hours while talking. The phone worked for about three days, while it was used in Moscow. In that time, I was making phone calls for no more than 30 minutes a day, plus using other phone features for 45 minutes. It takes about two hours to fully charge the phone. The phone's size is comfortable and you can carry it wherever you like (106x46x17 mm). It's weight is typical for phones of this class with its 75 grams and no major changes were noticed. 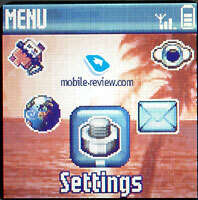 The interface is typical for Philips’ phones- the main menu is a row of animated icons, you can navigate the menu with the joystick. To get one level up - press C button. If you try to quit the menu with the red button like you're used to do in other phones - nothing will happen. There is no fast navigation with the help of number chains. But you can bind 8 shortcuts to different menu items to the buttons. 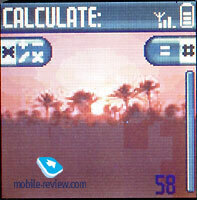 For example - if you press 5 during standby mode you will start the Calculator. Almost all sub-menus are represented as icons formed in a circle. If you use functions that are hidden down deep in the menu structure, you will have to work that joystick a lot OR start them with voice activation. Yep, the phone's memory can store up to 40 voice commands which can be used for accessing features that are used the most. Navigating the menu will become a lot easier and faster - you'll just have to get used to the Voice Command feature. Phonebook. Up to 300 names in the phone's memory. Several additional informational fields can be added to every entry (up to five numbers, e-mail and address). To access Phonebook from stand-by mode - just press the joystick down. Only one Phonebook can be displayed at a time (either phone's memory or SIM). While overlooking the entries only names and surnames will be displayed. If the entry is too long it will be scrolled automatically. 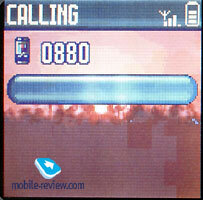 While an entry is marked a telephone-like icon will be shown on the right. This means that you can see other phone numbers attached to this entry. The number that was entered into the Phonebook first will be shown as default for every entry. In order to dial the selected number - just press Call button, but if you wish to edit the entry - you will be forced to list half of the mini-menu. The same operation is required for adding Voice Commands for Phonebook entries. Voice Commands work nicely and the handset handled the commands surprisingly nice. A dissapointing factor would be that you can bind the same voice command for different entries. In this case the phone will always use the most recently added command for the entry. The other one will be stored in the phone's memory, but will never be used. Phonebook supports first letter search, but in order to search again you have to hit at least one name after your first search. This flaw is caused because a name can be searched by entering several letters, for example Smith can be found by 7 (pqrS) or 6 (Mno) and 4 (ghI). A second variant would be more preferable if you have a lot of names in your Phonebook. 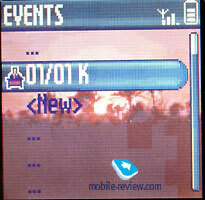 You can set melodies and pictures (Photo Call) for 20 groups in the Phonebook. Messages. 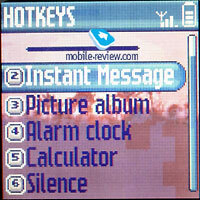 Here you can read incoming messages and compose your own. When you’re listing messages - they will be shown in full-length with the help of a preview line. And when you are selecting a message it will automatically scroll into full-screen mode. It's something new that we don't see everyday, and it's actually quite handy. 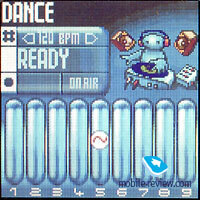 10 templates are already composed, which is more or less a standard in a mobile phone these times. You can add one or more funny icons or sounds for EMS messages if you like. Messages can be stored into an archive, you can also set outgoing messages to move automatically into Saved Messages folder if you want to. The built-in e-mail client functions with typical mail accounts (max. 2) based on POP3/SMTP protocols. 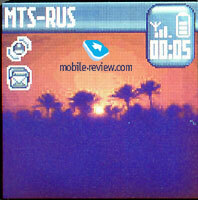 The phone can receive and send mail through a GPRS connection, but it doesn't support attachments (except jpg). Messages bigger than 10kb will be automatically denied. 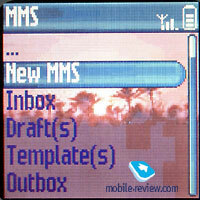 The handset supports MMS and is the second Philips mobile with this function (the first one was the 530). 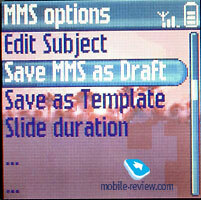 While composing MMS message a vertical set of 5 icons will act as an editor. 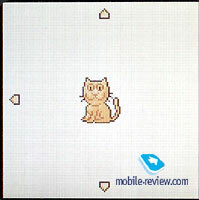 You can move between them and choose various options (sounds, pictures, text, add slide). Everything is very simple and understandable. Messages are delivered to other phones perfectly, no problems with this function at all. Settings. Basic settings. Everything is simple here, you have a security level setup, ability to choose one of five available themes for display, define backlight's working cycle (up to 1 minute), setup screensaver etc. All audio settings are located here as well: volume setup, vibrating alert, mixed mode. And last, but not the least - five settings for equalizer which are used when talking on the phone. They were possible with the help of ARM codecs. The only problem is that this feature must be supported by your operator. I've tried changing the settings, but everything remained the same because my operator didn’t support this feature at this time. The Philips 350 supports profiles, but all of them except one are locked and can only be used the way they are pre-installed, no settings can be changed. Only the custom profile can be changed according to your needs so it turns out that the phone has only one true profile. Picture Album. 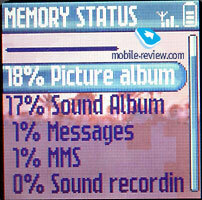 A list of pictures in the phone, and there are quite a lot pictures pre-installed. Most of them are pictures of animals and children. 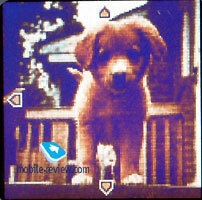 All pictures are stored in jpg format which is supported by the phone. You can see all pictures or choose one for background. 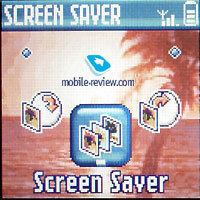 One of the most interesting features is that you can easily create screensavers, using only one or a number of pictures. 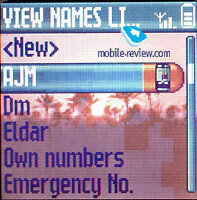 You can also see icons that are used for EMS messages. Sound Album. Well, as in the previous case the title speaks for itself, here you can find melodies and records made with the voice memo feature, both can be used as ringtones or reminders. Voice memo. 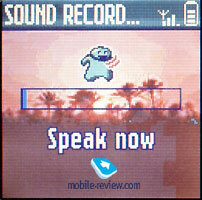 You can store sound records made with this dictaphone feature, which can also be enabled during a conversation (records both parts) and in stand-by mode. The length of the record depends on the current available memory. Memory Counter. Displays free/allocated memory stats of the phone, which is very useful because it shows how many percent is used by every application. Besides, you can also pick a specific application and see how much records and memory it uses. This handset has 1978 Kb for memory, with about 450 Kb already used by java and files. BeDJ. The last item in the menu is the music editor - BeDJ. Philips makes a great stake on this one while promoting the 530 series. You can mix different tracks in existing melodies and choose various tones for them as well. It's a nice thing for entertainment, especially if you are interested in musical experiments. Games and Applications. Various useful functions are located here, an alarm clock for example. Recurrence can be set as well, including an "only during weekdays" option. The calculator has basic functions, nothing extraordinary. 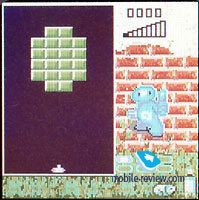 The brick game (Arkanoid-type) is quite simple and is the only one in the phone. Organiser. As the title so cunningly may reveal - this menu item stands for the Organiser. You can see a Calendar (for a week or a month). 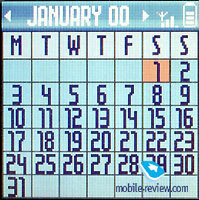 While looking at the month mode in the Calendar some events arranged are marked out. 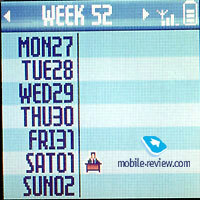 And when you are looking in week mode you can see special icon near every day that has an event planned. There are three types of events: meeting, relaxation and business. For every record a date of beginning and end can be set. They can also be set at several intervals (a day, a week, a month and a year), you can also set a reminder-time to start warning you about the event. There is also a function that allows you to delete all old events at once, which I find very useful. On the whole - the Organiser works fine, nothing special though. 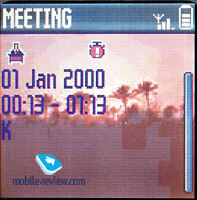 The memory of Phonebook and Organiser are combined and shared dynamically. A little surprise: you can record 300 Phonebook entries only if there are no entries stored in the Organiser. Call list. List of calls, it's common, meaning that the last 30 missed, dialed and received calls are listed in this menu. You can look up the date and time of each call. They can be seen if you press the joystick up once. 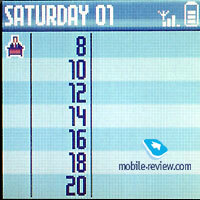 The numbers can be used the same way as in the Phonebook (messages, details etc.). Operator Services. The WAP browser can be accessed from here. Nothing special, the phone has GPRS (4+2) and it works fine. No bad words can be said referring to the quality - everything is done at a good level and can be compared with the rest of Philips handsets and other mobile phones as well. The vibrating alert is a bit weaker than most of you are used to, but you can still feel it if you are carrying it in your pocket. 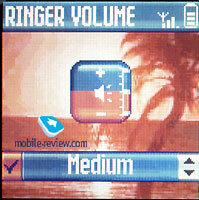 The ringtone volume is average, perhaps sometimes you might even miss a call if you are in the street, but the quality is pleasant and soft. This part of the phone is really competitive with other mobiles and better than those of Nokia, Siemens, Motorola and others except for Korean phones (Samsung and LG) and Sony Ericsson, which are slightly better. The phone is scheduled for release in the beginning of December. It will cost about $150-$160. Philips tries to impress everyone in this low-end segment with unusual design, which will be quite popular, plus usual functions for this type of phone and even something more. A lot of people will enjoy recording sounds via mic and setting them as ringtone or reminder afterwards. Considering high competition level between models of middle-class you should realize that the phone will not be very popular, neither will it be a failure. 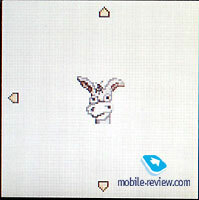 If anyone wants to feel different from others - this phone is the perfect opportunity. Those of you who have used Philips phones before and liked the interface will definitely appreciate this new model.